Record collector John Tefteller, recently placed the winning bid of $5,250 on eBay for by Sunny Boy and his Pals "Hey! 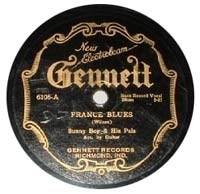 Lawdy Mama - The France Blues/Don`t You Leave Me Here:" on a Electrobeam Gennett 78 rpm record (Ge 6106. The recordings were made in Chicago, circa 8th April 1927.